What is more patriotic than a juicy, quality rack of smoked ribs with honey butter brown sugar? (When it comes to main courses and entrees, of course.) Every grill around America is fired up and ready to go! So How Exactly Do You Smoke Meat? The purpose of smoking foods, specifically meats, is setting it at a low temperature and slowly cooking it. Not only do the pellets placed in the grill infuse the meat with flavor (we recommend the Champion Blend), but the low and slow method makes your food incredibly juicy, moist, and all-around amazing. We’re talking restaurant quality. Also, with this pellet grill, you set it at one temperature and the grill does the rest! Just think of it as the slow cooker’s really buff uncle with the beard, who doesn’t mess around when it comes to quality food. 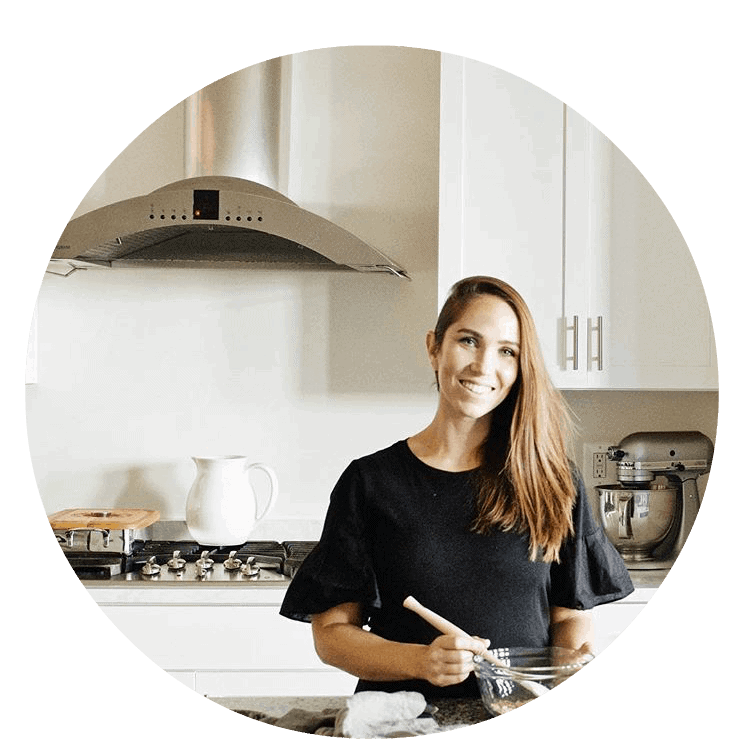 Are you convinced you need to buy a smoker now? (For the record, a smoker is the same thing as a pellet grill, which is not a traditional BBQ grill—I was confused at first too, ha!) Or at least get one for your husband? It’s one of our favorite ways to cook our meat now. There’s just a little bit of prep involved, and the smoker does the rest! 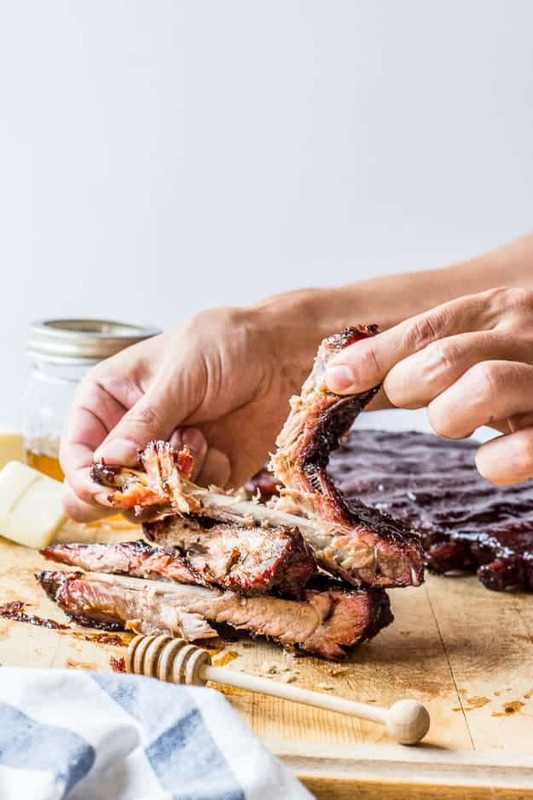 Now, grab the full recipe to these smoked ribs with honey butter brown sugar below! Enjoy! 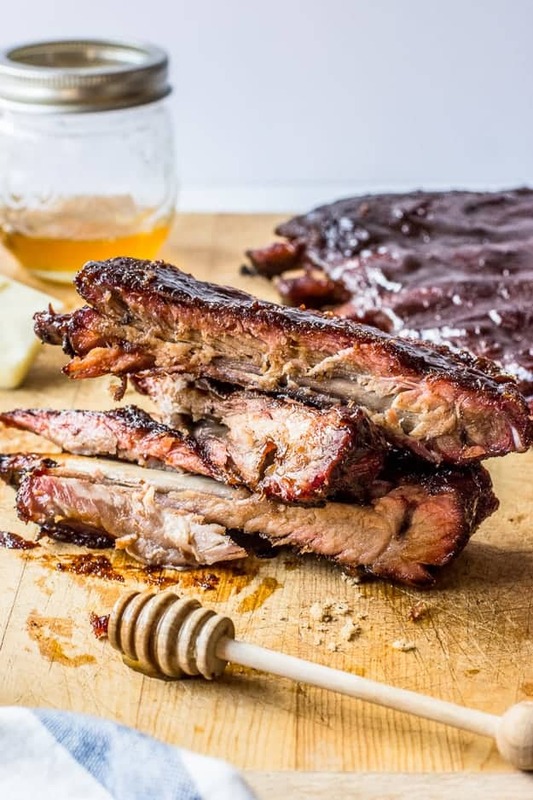 The most tender and juicy smoked pork ribs made with honey butter and brown sugar. This will be a family BBQ staple! Remove rib membrane from the bottom. Apply olive oil to both sides. Generously coat bottom, top, and sides of ribs with rub, working the rub into the meat with your hands (ideally the night before so rub sets in). Fill up pellet hopper with pellets of choice. Set temperature to 225°F. Allow smoker to preheat. Put ribs on. Spritz with apple juice at one hour, and two hours. After three hours, remove ribs. Apply butter, brown sugar, and honey to both sides. Double wrap in foil. Place on grill, with meat facing down (bones face up) for two hours. Remove from foil. Set on grill for one more hour. Apply BBQ sauce with 15-20 minutes remaining. Temperature should be between 190-195°F. Remove and dig in while warm! Enjoy! P.S. If you like this recipe, check out my Steak Kebab Skewers with Peach Salsa, and my Grilled Chipotle Lime Steak Fajita Salad! We live in a small city apartment and aren’t allowed to have a grill or smoker could this recipe also be made in a low temp (200-225 degree) oven and just add smoked spices like paprika to get a little smokiness? 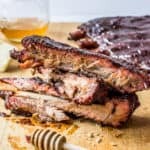 I know the Smokey taste wouldn’t be there but my roomie loves ribs and I’d love to make them for him! Hey Kim! Yes you can bake them slow and low. Also, there is smoke flavoring if you don’t have smoker. I’ve never used it, but I’ve seen it in some recipes. Worth a shot! Ribs are already delicious. But that Honey Butter Brown Sugar has me drooling! Well, these look tasty and beautiful! I am cooking ribs tomorrow and this post inpired me!